..... Flox is a mixture of cotton fiber (flocked cotton) and epoxy. The mixture is used in structural joints and in areas where a very hard, durable buildup is required. Flox is mixed much the same as dry micro, but only about two parts flock to one part epoxy is required. Mix in just enough flox to make the mixture stand up. If "wet flox" is called out, mix it so it will sag or run. ..... When using flox to bond a metal part be sure to sand the metal dull with 220-grit sandpaper and paint pure mixed epoxy (no flox) on the metal part. ..... Throughout these plans the term "Bondo" is used as a general term for automotive, polyester body filler. Bondo is used for holding jig blocks in place and other temporary fastening jobs. We use it because it hardens in a very short time and can be chipped or sanded off without damaging the fiberglass. Bondo is usually a dull gray color until a colored hardener is mixed with it. The color of the mixture is used to judge how fast it will set. The more hardener you add, the brighter the color of the mixture gets, and the faster it hardens. This simple guide works up to a point where so much hardener is added that the mixture never hardens. Follow the general directions on the Bondo can for fast setting Bondo. Mixing is done on a scrap piece of cardboard or plywood (or almost anything), using a hard squeegee or putty knife. A blob of Bondo is scooped out of the can and dropped on the mixing board. A small amount of hardener is squeezed out onto the blob and then you mix to an even color. You will mix the blob for about one minute. You will then have two to three minutes to apply it before it hardens. ..... Be sure to clean the board and putty knife off before the Bondo is completely hard. MEK will clean Bondo off your putty knife and squeegee if it isn't completely hardened. 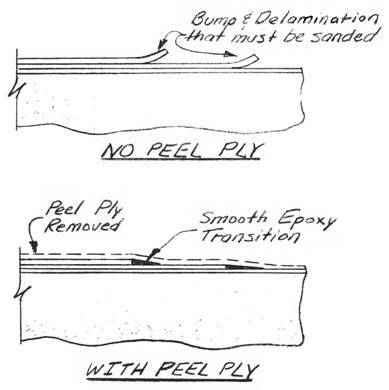 (1) Peel ply any area that will later be structurally attached to another fiberglass layup. Once the dacron is peeled off, the surface is ready for another layup, without sanding. If you do not use peel ply, you will have to sand the surface completely dull (no shiny spots). This sanding is hard, itchy work and ruins the strength of the outer ply of fiberglass. .....Note that to peel ply the trailing edge overlap area, the peel ply is the First ply made to the foam core, Lay a strip of dacron down on the overlap notch and secure it with tacks or staples so it doesn't move when you layup the skin. (2) The second use for peel ply is to transition the area where the top ply of a layup terminates on the fiberglass surface. .....Refer to the adjacent sketches. If the top ply edge is laid up bare it results in a rough edge that can delaminate if a little dry. Sanding the rough edge is hard, itchy work and usually results in damaging the adjacent surface. 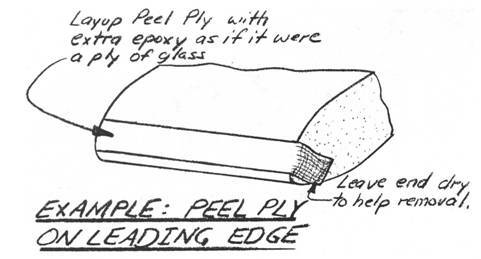 If the edge is overlaid with a strip of dacron during the layup (lay on the dacron and wet out by stippling or squeegeeing) it will make the edge lay down flat and will form a wedge of epoxy to smoothly transition the edge. After cure, peel off the dacron. The result is a beautifully transitioned smooth edge with no delamination tendency. Use this method in all places where a cloth edge terminates on the surface. ..... Three different types of rigid, closed-cell foam are used. A low density (nominally 2 lb/ft3) blue-white or orange, large-cell styrofoam is used as the foam core of the wing, canard, vertical stabilizer, and control surfaces. The blue-white or orange foam is exceptional for smooth hot wire cutting of airfoil shapes. The large cell type used provides better protection from delamination than the more commonly used insulation-grade styrofoams. .....Low density 2 lb/ft3 green or light tan urethane foam is used because it is easy to carve and contour, and is completely fuel proof. The urethane used is Urethane 210 or equivalent. .....The white styrene modified urethane foam is used in medium density (4-6 lb/ft3) where higher compression strength is required. .....Do not substitute foams for those supplied by Quickie Aircraft Corporation. For example, the Q2 blue-white or orange styrofoam has great glass surface peel strength than the standard blue styrofoam sold by some distributors. Also, we considered using the "fire resistant" BROWN urethane instead of the green 2 lb urethane, but found its physical properties, fatigue life, and fuel compatibility to be much lower than the urethane supplied to Q2 builders. Do not confuse styrofoam with white expanded polystyrene. Expanded polystyrene is a molded, white, low density, soft foam, which has the appearance of many spheres pressed together. This is the type used in the average picnic cooler. It disappears immediat1ey in the presence of most solvents, including fuel, and its compression and modulus is too low. .....All three types of foams, urethane, styrene modified urethane, and polystyrenes are manufactured in a wide variety of flexibilities, densities and cell sizes. Getting the wrong material for your airplane can result in more work and/or degraded structural integrity. Since sunlight can damage foam, avoid exposure of foam to the sunlight by keeping it covered.